Based in the Brent Street side of Hendon NW London since 2005, Allen and Young Removals have moved thousands of clients throughout North, NW and West London. We know the area and understand what challenges we are likely to face when moving people around this busy part of London. Whether you’re moving to the huge development at Beaufort Park in Colindale, the Georgian town houses in Camden or around the narrow lanes of Mill Hill Allen and Young removals have done it many times before and are experienced in moving in NW London. Our Storage facilities are also based in North West London on the A406 North Circular Road. As we are based in NW London Allen and Young can easily do moves or quotations at short notice, we will always try to help if we can. We offer our full range of packing services in North West London and also provide House Clearance services and overseas removals. We are please to confirm that we offer the full range of our moving services in all North West London Districts and all of the following postcodes: NW1, NW2, NW3, NW4, NW5, NW6, NW7, NW8, NW9, NW10 and NW11. Allen & Young Removals of North-West London are fully insured and guarantee that you will receive a professional service at all times. Simply click on your area for further information. The boundaries of the area and its numbered districts have changed over time and are the result of the working requirements of the Post Office. They are not tied to those of the local authority areas served; consequently a locality name might describe varying areas. 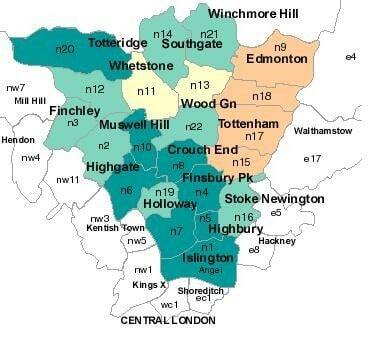 The postcode area contains large parts of the London Boroughs of Barnet, Brent and Camden with minor (some very small) parts of the City of Westminster, the London Boroughs of Hammersmith and Fulham and Ealing, and Hertsmere District. The remainder of north west Greater London is covered by the HA, UB and a small section of WD postcode areas. The NW7 district extends to the Greater London boundary with Hertfordshire and follows that boundary for a short distance near Scratch Wood.